Detailed review of Boscia Exfoliating Peel Gel. See how it stacks up against other exfoliators! Boscia is a Japanese skincare company dedicated to making products that are botanically based and free from preservatives. I was excited to try this, because I liked the ingredients listed and using a gel peel is different than a lot of exfoliators out there. First off, this exfoliator is really gentle. If you are looking for something that has granules or exfoliating beads, this is not the product for you. While I was applying it, I thought it was refreshing. Small rolls form on your skin as you are working it into your face, which is really different. One of the issues I had with Boscia Exfoliating Peel Gel is getting it all off my face each time I went to rinse. The small rolls that seemed to form would stick to my face, which was really annoying. This is supposed to be both a physical peel and a chemical peel. For me, the physical peel didn’t really do the trick. I noticed a lot of spots on my face that were not well exfoliated once I was done. I ended up giving this 2 out of 5 stars just because in terms of exfoliating, I wasn’t that thrilled with the results. Boscia Exfoliating Peel Gel is a clear gel that is kind of thick, but it separates and becomes more watery when you apply it. This doesn’t really have any specific smell, but it smells a little sweet. It has a light smell of herbs, but it is refreshing. This is one of the weirdest exfoliators I have used. Getting it out of the bottle is easy, but when I went to spread it across my face, it seemed to separate. As I continued to exfoliate, small rolls seemed to form, which are from the ingredients in the peel as well as the dead skin that is being removed. It seemed like the small rolls forming were more of the peel than the actual dead skin I was trying to get rid of. I didn’t really feel like I was getting a very deep or effective result while I was using it. The most irritating part was trying to rinse it off. The small rolls that form would stick to the small hairs on my face and I really couldn’t seem to get it all off. It wasn’t until I went to dry my face that I could really rub it off my skin, which was frustrating and weird. I didn’t notice any drying or redness, but my skin was a little irritated in some areas after trying to get all the residue off my skin. I also noticed patches of dead skin that I wasn’t able to exfoliate because the product wouldn’t really spread evenly over my skin. Right after I applied it, I noticed my skin felt really clean and refreshed. There were some uneven spots on my face, but the places I was able to really exfoliate looked great. After several days, my skin looked a little brighter and was completely clear. I didn’t really notice any difference in some of the fine lines I am worried about. I was worried that my skin would dry out over time because of the chemical peel, but I actually liked the results more than I thought I would. Overall, I thought my skin looked a little healthier, but for the hassle of washing it off each time, I didn’t love this exfoliator. One of my favorite things about this exfoliator is the list of ingredients. Pomegranate Enzymes are known to help with skin discoloration. It can lighten skin and help with exfoliation and removing that top layer of dead skin cells. Lavender Oil has been used in all kinds of skin and homecare products. Lavender is known to be very soothing. For the skin, it provides antiseptic protection as well as reduces redness and inflammation. Jojoba Seed Oil comes from a shrub and has anti-inflammatory properties that help with redness and irritation. It is also said to have antibacterial effects, which can help keep skin healthy. Tumeric Root Extract can help reverse skin damage from aging as well as discolorations from sun exposure. It also has antifungal and antibacterial properties. A 5 oz bottle is $34.00, which comes out to $6.80 per oz. Per oz, I thought this was a great price for all the amazing ingredients. 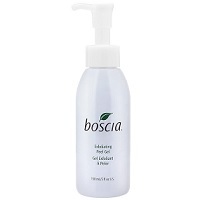 To buy Boscia Exfoliating Peel Gel, click here. Application Process Very easy to apply. Does not completely rinse off well. Results Leaves skin feeling clean and refreshed. Not physically exfoliated well.